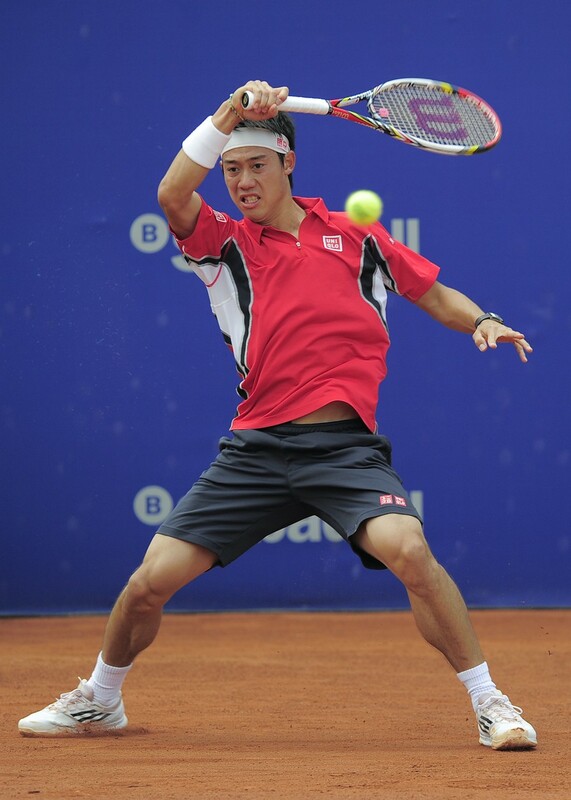 Quick Tennis Tip: Keep Your Head Fixed at Contact! On all of your strokes, whether it is the forehand, backhand, volley, smash, or serve. You should have your head and eyes fixed on the contact point (where you strike the ball) until the ball leaves your racket. Note that it is impossible to keep your eyes on the ball at impact because the ball comes and leaves too fast.The goal here is to just keep your head and eyes fixed on the contact point. When you do this, you will strike the ball cleaner and also decrease the chance of mishitting. If you do not keep your eyes and head fixed on the contact zone, you will disrupt the swing path because you end up jerking your head up too soon to see where the ball is going. As you can see Federer below, he is not watching the ball, but he is keeping his head and eyes fixed at the contact zone to prevent the disruption of the swing path to the ball. This entry was posted in Tennis Instruction/Tips and tagged advice, american tennis, andre agassi, atp backhand, ATP forehand, ATP tennis, backhand, backhand technique, bernard tomic, biomechanics, california tennis, coaching, drills, forehand biomechanic, forehand fundamental, forehand technique, fundamentals, hit through the ball, roger federer on December 22, 2014 by simplemoderntennis. 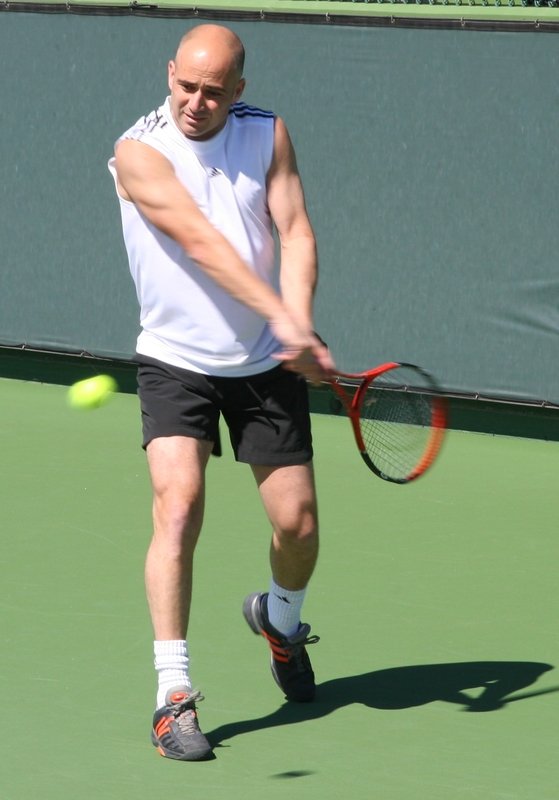 From reading through many threads and videos on the two-handed backhand, the majority of people argue that the two-handed backhand is basically a lefty forehand. 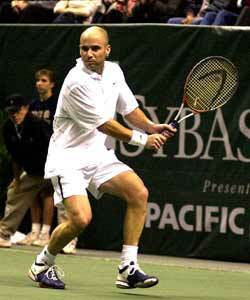 However, tennis-legend, Andre Agassi, who possesses one of the best two-handed backhands in the game, says otherwise. I initially did not believe Andre Agassi knew what he was talking about due to the fact that many people said otherwise, but after experimenting with the technique and observing a lot of slow motion footage, it seems after all, Agassi knows what he’s saying. How could I have ever doubted him? It’s understandable that his statement will yield different interpretations. People will think that you lead with the right hand throughout the entire shot; however, this is not what he meant by primarily using his right hand. The right hand is the key to produce leverage. Leverage is achieved when the buttcap of the racket is pointed at the ball and the right hand is what gets you into that position. The use of the right hand happens during the forward swing phase. From the takeback, notice how the left hand is leveled higher than the right hand. Now in the forward swing, the right hand will be dominant. When beginning the forward swing and uncoiling the body, the positions change; the right hand drops, causing the left hand to fall below it. Here, proper leverage has been achieved. Right hand drops, left hand falls below the right. Though, in the end, as a result of the uncoiling, the left-hand will propel forward naturally and strike through the ball. It makes sense for people to say that the two-handed backhand is similar to a lefty forehand because the left-hand is what really strikes the ball, but the forward swing phase and use of the right hand is what makes it not exactly like a lefty forehand. The right hand plays a key role in creating leverage and that is why Agassi says that the best backhanders in the world use their right hand in the shot. Feel free to leave questions and suggestions for future videos and articles! This entry was posted in Tennis Instruction Videos, Tennis Instruction/Tips and tagged advice, american tennis, andre agassi, atp backhand, ATP tennis, backhand, backhand technique, bay area, bay area tennis, biomechanics, coaching, drills, novak djokovic, online tennis blog, online tennis instruction, two-handed backhand modern backhand tennis modern tennis technique fundamental straight arm novak djokovic david nalbandian forehand strokes groundstrokes tennis t on November 1, 2014 by simplemoderntennis. Stop Brushing the Ball! Learn to Hit Through It! This entry was posted in Tennis Instruction Videos, Uncategorized and tagged backhand, bay area tennis, brushing, california tennis, drills, forehand, fundamentals, hit through the ball, novak djokovic, online tennis instruction, roger federer, technique, tennis coach, tennis topspin drive, tutorial on July 7, 2014 by simplemoderntennis.